We will once again join the national ‘Visit My Mosque’ initiative run by the Muslim Council of Britain. The event will run from 11am to 4 pm and will feature tours, free refreshments, face painting and more. 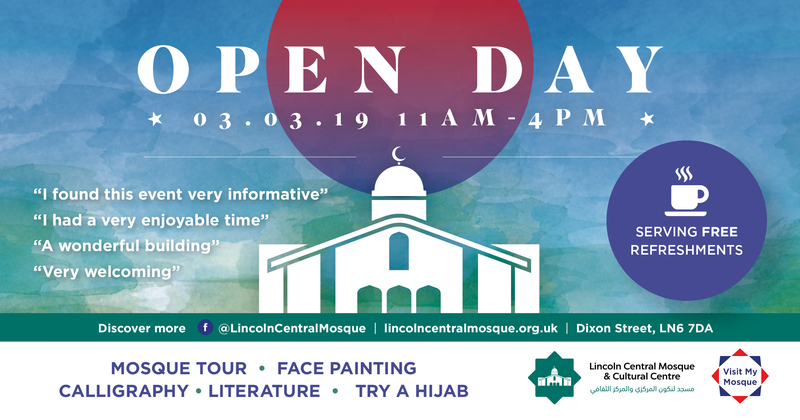 Last year , we opened the doors of our new mosque to the local community and received a great response with over 700 people attending. Visitors can come at any time between 11am and 4pm. If you would like to witness the prayer, you can plan to attend 12:50 pm to witness the prayers at 1 p.m.
We hope this year will be an even bigger success. Help us by sharing the Facebook event. Dress code: All adult visitors and children above the age of 12 are requested to observe modest dress when visiting the mosque.